Six of Crows blew my mind! What a fantastic story it was!! The characters are all memorable and they were easy to root for. Mrs. Bardugo did a truly thorough character development. Since this is my first book I have read by er, I had no idea what Grishas were. After reading this story, I want to meet a Grisha. Their powers amazed me. Let's talk about the story. A new drug called jurda parem has been developed. This drug can make a Grisha's power a thousand times more powerful. Unfortunately for the Grishas, it's highly addictive and destructive to them. Whoever has the formula will rule the world. Six characters are hired to retrieve the person who's responsible for creating this drug. In order to extract the individual responsible, they will have to invade Fjerdans's Ice Court which is protected by the Drüskelle (especial army). This is known to be impossible to perform but our main characters don't believe so. "You're all horrible," said Matthias. These six characters come together by way of Kaz Brekker. Kaz is the lieutenant of a gang in the Barrell. He's smart, resourceful, cunning and determined. He's also interested in the money they will get paid by Van Eck once they retrieve the creator of the drug so he can fulfill his revenge. Inej owes her current status as the Wraith to Kaz. She was kidnapped and taken to be part of the menagerie as an exotic. Kaz saved her from that life. Inej would always be thankful for it and despite her better judgment, she has developed feelings for him. Nina is a grisha who was trained as a fighter. She has remained in Ketterdam and is working for Kaz while she waits for an opportunity to liberate the man she wronged. Matthias Helvar is a druskella. He is a warrior who's job is to capture grishas. He made a mistake of trusting the wrong woman and she betrayed him. For months, he has been a prisoner and when Kaz's offers him his freedom and a pardon, he's not able to turn it down. Even if cooperating with them means becoming a traitor to the druskella and Fjerdans. Jesper is a sharp shooter. He's also a gambler and he has accumulated quite a debt. Kaz's new job offers him a way out. If the mission succeeds he would have all the money he needs to settle down his debts. Wylan is Van Ecks son and he has joined Kaz group as well. He is good with ammunition, explosions and sketches. As you can see, these characters are all interesting. 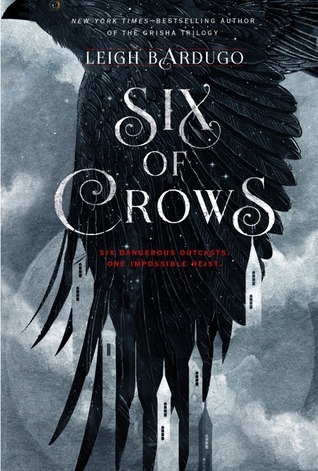 If that wasn't enough, Six of Crows has so many twists, surprises, and WTH moments which made it a phenomenal story. Believe me, this book is a must and as a movie it would be amazing! Book 2 where are you?? ?